I don't know if anyone else is having problems posting, but Blogger is being very stroppy with me over the last couple of days and error messages keep popping up all over the place. Gggrrr...just taken me ages to upload these photos. My followers list has vanished as well. Still, I suppose we just take all this technology for granted these days, and forget just how remarkable it is that we can all share our thoughts, experiences and pictures across the world without very much effort at all. So - I will retract my grumble hencewith! This A6 clear set is called "Nativity Unto us a Child" PICSA6258. 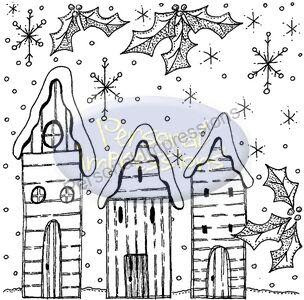 My castles stamps have been so popular, that I decided to create a Nativity set that included some Minarets to give the same versatility in building a scene. Of course, the Minarets can be used beyond Christmas to make general fantasy castles. Next is another A6 clear set which I hope you'll find useful. It's "Silent Night" PICSA6263 and has fourteen handy texts and messages in various styles. I really hope that this next set will make you smile! This is A6 clear set " 'Ave an Elfy Christmas!" PICSA6260 and you can tell from the title and the messages on the set that I can see lots of uses beyond Christmas for these characters....and lots of terrible puns! The last of the clear A6 sets is another verse one called "Why do I bother?" PICSA6264. This one has a humourous three verse poem that may ring a bell with mums, or anyone who knows a busy mum! 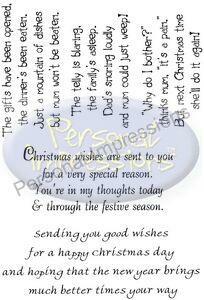 There are also two useful, more simple verses that are perfect for inserts or even on the front of a card. 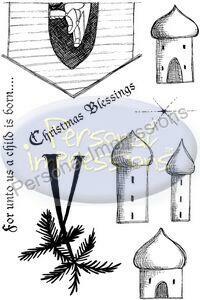 The next design is an unmounted rubber single stamp entitled "Christmas Village Collage" PIRS027. Again, this one can be used as a full image or the individual elements can be snipped out and used seperately. The last picture is of "Jolly Holly" PICSA6265. 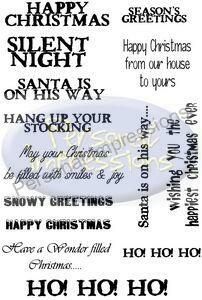 This is a whimsical mix of "curly" Christmas images and a happy snow couple. I am envisaging a long row of the stockings in an array of lovely colours....watch this space! Well, I hope you enjoyed looking at the festive designs and I will post examples of how I've used them as soon as I can. Now I am looking back up at the windows and seeing the summer sun streaming in and it does seem odd after just posting about chilly winter Christmas images! Quite a few of you have been asking about Thomas, so I can say that he is well and truly settled in now, has been upgraded from the less expensive supermarket's own brand cat foods to the "good stuff", has just about killed all his toys, is taking up most of the bed and is still under training to stop stalking the birds at the window! The squirrel is still demanding to be fed by tapping on the window and he has just had a treat of a mini Snickers from a box of Celebrations! Squirrels love chocolate and, of course, this had nuts in it too! Don't worry - I don't regularly give him sweet treats, and it won't do him any harm, though he may run around the trees a little more quickly for the next fifteen minutes...lol!! Right, that's me done for today. Hope you have all had a lovely weekend and looking forward to seeing some of you next Saturday for the first of my new workshops! Wow Lindsay, just catching up and I think I 'need' most of your new stamps! Is not eating going to be the new way to slim?!!! 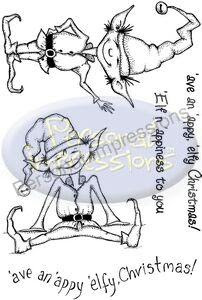 Has to be Elfie for me. He is right up my street. Saw your post last night on my phone and tried to comment but couldn'nt. Not sure if that was Blogger or not but he is getting up my 'elfing nose' now too. PS the word verification below is "Dimbo"....nice!